Truck Bed Bike Racks - no qr mounts! Discussion in 'The Lounge' started by bdamschen, May 9, 2012. 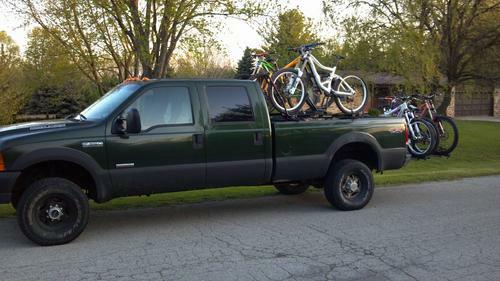 Normally I'm captain tailgate pad- but I'm picking up a small 2 seater truck for teh mpgz and I started looking around for racks that I can mount my bike in the bed all awesome like this, but without the pain of using tie downs. I'm gonna use both short travel and dh bikes, so it must work with 15mm and 20mm axles too. I just built something using 2*4s. I can take pics if you want when I get home. I can get 3 DH bikes in my Ranger no problem and, I suspect, with a bit more thought, I could have designed the rack to hold 4. 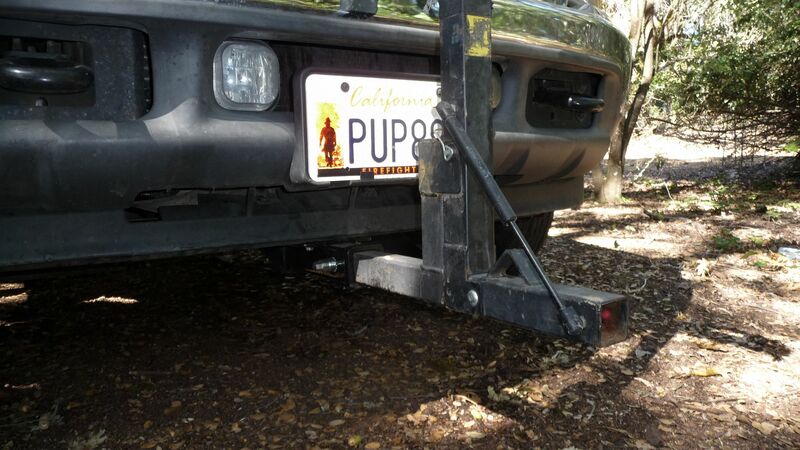 Mount a roof rack bike tray to a board and use that or a Thule insta-gater. I've also seen some homemade pvc pipe racks. Insta-gater looks pretty cool. Wish I could mount the bikes frontwards for extra style points, but that's pretty cool. Anyone done the roof rack tray in the bed maneuver? Got pics? i mounted 2 Thule instagators to a piece of 1' x 3" aluminium tube with 3/4 conduit staps and mounted the alum to my F250 using the factory bed bolts. It looked clean and could be removed in 10 min. Sry I dont have any pics and I sold the truck. Still the tailgate pad is so much easier and way less expensive. Nice! Tailgate pad won't work for what I have in mind due to speeding. I have a Saris Triple Trak, and a Hurricane Fork Up for my 20mm and BigT's Lefty. hurricane may make an adapter for the 15mm, I don't need one, so I haven't looked. Man, I made one of those years ago, and now I use it in my bike room, but it was not stable enough to use in my truck. Flexed like hell until it would come apart. I made a pvc one a few years back. 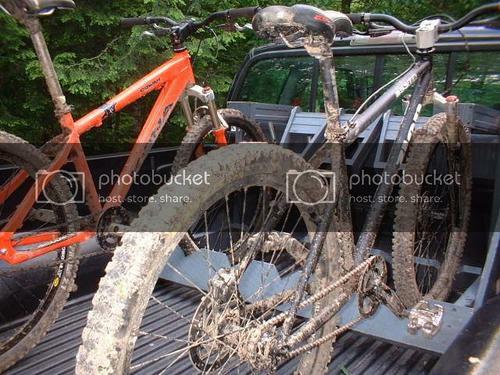 Worked great, but you need tie downs or alot of gear to pack around the bikes. Also, I would advise drilling through the key joints and reinforcing them with bolts. The pvc cement tends to come undone in extreme weather...I was in teh Mojave desert and the heat was too much for it I believe. I didn't want to lose any bedspace since I often have a full cab and gear to bring with me, so I mounted roof rack bars to my bedrails and used roof rack trays. I like this idea, if you can sacrifice bed floor space. My husband custom made one with heavy duty springs and wood. I thought I had a better picture of it, but am not finding it here at school, so here's one that isn't great to give you the idea. I've got a simple one that is awesome. Not pretty, but very effective and "brutally simple" as a hipster once said. Never been able to eject a bike (never using tie-downs)- Once I did 50mph over 25 mph speedbumps holding two dh bikes and a tandem with the tailgate down. Not to mention the regular high speed rally/shuttle driving. Works with bmx and xc bikes. Mine was built for 2.5 minion tire width, which is pretty darn close to most AM tires. The difference with my rack from the regular lumber rack is that there is no ugly upright to see in the back of the truck, and the friction from the deep slots holds the bikes quite well. It's rad and it's cheap. PLUS it won't dent the sh*t out of your downtube when you're shuttling the way that shuttle driving should be done. Lumber: 2x10, preferably treated- mine isn't and won't last as long. Total width(sideways across bed): will vary depending on truck-bed width and how many bikes you want to carry. Four spaces for bikes works well on small trucks like mine (older toyota). The important part is the slat spacing.. Make sure it's right, otherwise the bikes will hit each other excessively while driving. 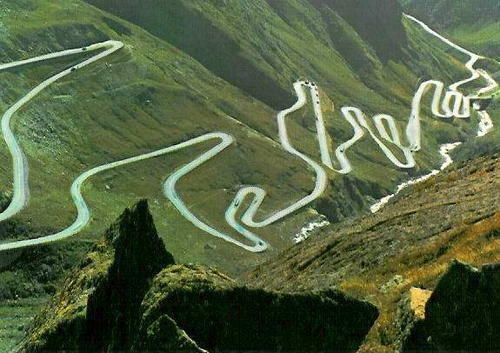 Bikes are meant to go forward, back alternating. Slat Spacing (on center) for bike wheels: 3-7/8"
Slat Spacing (on center) between bikes: 7-1/2"
Slat cut out (v-cut): this is so the slats don't interfere with disc brakes and derailleurs. I have a template for a nicer looking design on AutoCAD I can email anyone if you like. If you do your own, I think needs to be around 5" deep. I throw a cable lock through the wheels from bed hook to bed hook in front for freeway travel. It A.) secures the load and B.) bikes locked for stops to eat, etc. oooooh... Tied for first, now I need to think on this. 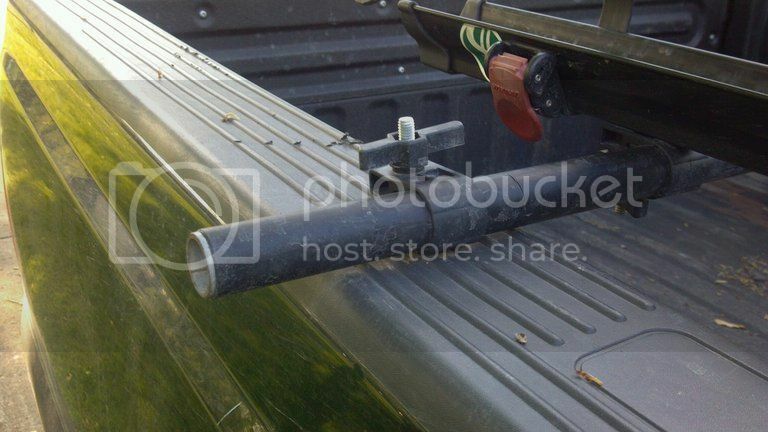 How are you mounting the roof rack bars to the bed rails? 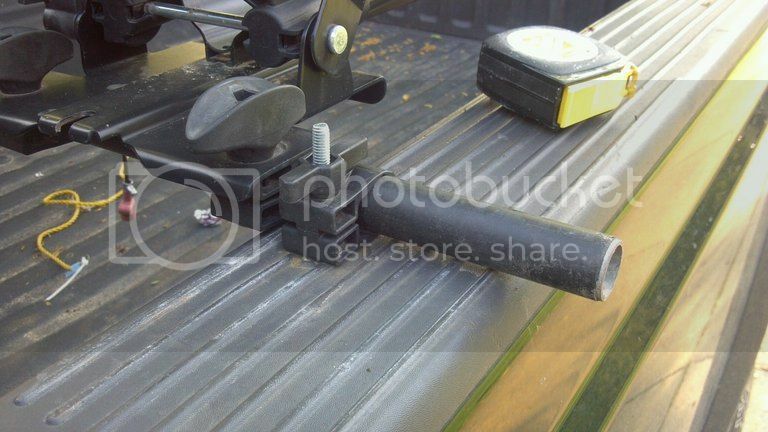 I used a 2x12, one wood drill bit and a hand full of wood screws and made a set-up for my truck, I will post a pic. of its "awesomeness" tomorrow. Nothing fancy at all. But I can put it on and off without tools, by myself, and I get to keep all my bedspace (with the height of my bedrails a cooler and rubbermaid tubs with my stuff fit perfectly under it and stay dry) in fact int he original picture we had 5 people packed for a weekend of riding, so all of our gear/clothes/tools/camping equipment is in the bed. I have a rubber bushing (used the round bushings from the end of a front shock absorber for a jeep wrangler they are round and 1/4" thick or so, about the diameter of a half dollar) on the underside up top its just the clamp and the bolt, the bars rest on the truck so the clamp only holds it in place and doesn't see much of the weight. Simple stuff, I'm going on season two of this set up and it's worked fine, had up to 7 bikes acrossed it before (I support the bars in the middle of the bed when I load them up this heavy cause they start to bounce and sage a little). Ground to bar measurement is 57" or so. Outside bikes are easy to load from the ground, the bikes in the middle load easier from the bed. Need to trim my mounting bolts down a little. Mine is awesome. Yours can be sweet or rad or something like that. Good thread idea, btw. Fun topic- easy to make functional custom stuff to perfectly suit ones needs. I made mine out of 2x4's and some springs from lowes. worked awsome for the 8+ hour trip from my place to kingdom trials last fall. there is a clamp to hold the top of the tire and i put a strap across the other end of the bike just to be sure. Thanks for the info! I'm gonna see what I can do to bust out something similar. Extra bed space for gear bags and whatnot would be rad since it's a single cab truck. 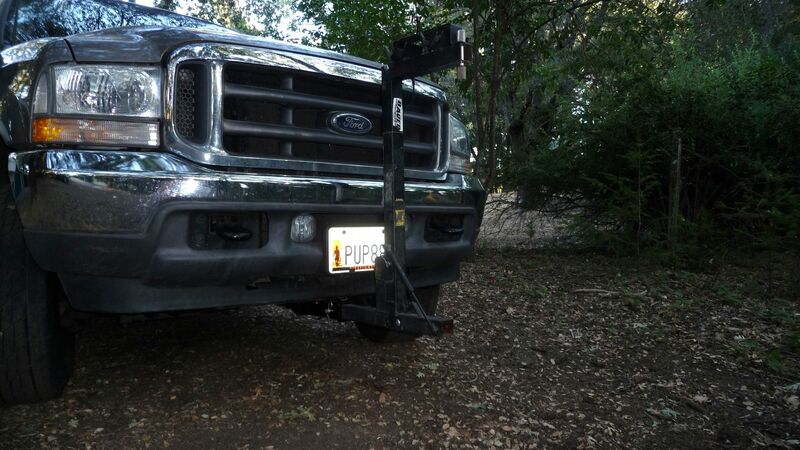 I thought about adding a front hitch, but didn't want all the road debris from cars hitting my bikes, didn't want to block my line of sight, nor my headlights, and wasn't sure on legalities. Other than the bikes sticking over the roof a little and adding some wind drag/lack of fuel mileage, I'm extremely happy with my set up.